Sir Dave Brailsford is among those eulogising over the 20-year-old. Mullen has been preparing for the season in Belgium with his team mates. 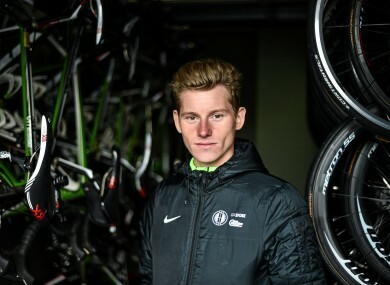 SUCH HAS BEEN his meteoric rise to the brow of Irish cycling, Ryan Mullen admits his achievements of the last twelve months came as a surprise but now, as the countdown to the 2015 An Post Ras begins, he is determined to go through the gears and step-up his game. Last year, Mullen, who was born in England and schooled in Wales, became Irish road race champion as a 19-year-old and then showcased his burgeoning potential by claiming silver at the U23 World Championships, falling agonisingly short of gold. The rider who pipped him to the post – Australia’s Campbell Flakemore – was snapped up by BMC Racing and many expected Mullen would begin this season riding for a World Tour team as well. However, Mullen is pragmatic, fully aware time is on his side, and has instead opted to honour his contract with the An Post-Chain Reaction team as he continues to learn his trade as an apprentice under the tutelage of Sean Kelly. “I don’t really get involved in the hype,” Mullen told The42. “I didn’t really speak to any other teams because I wanted to do my two years with this team, it could be longer I don’t know. Mullen has been clocking up the miles alongside his team mates at their training base in Belgium and the 20-year-old will split his time between riding on the continent and representing Ireland on the track. It’s a congested, unrelenting itinerary with the An Post Rás at the forefront of the schedule. The 2015 edition begins on 17 May in Dunboyne and Mullen is hoping to be on the start line of Ireland’s premier cycling event for the first time this year. Following on from the hugely successful staging of the Giro D’Italia twelve months ago, the Rás will feature finishes in Carlow, Tipperary, Newport, Ballina, Drogheda and Skerries as organisers seek to exploit the sport’s surge in popularity on these shores. “When I go home there are 40-50 cyclists out and it’s great to see. I always wanted to become a professional cyclist, it’s all I’ve ever known and hopefully there will be a new generation to come from this boom we’re seeing now,” Mullen added. Mullen has certainly experienced the highs and lows. Half a year after the heartbreak in Spain, the young sensation admits he still has sleepless nights agonising over the 48 second margin which saw him miss out on gold but the experience has strengthened his resolve. “I’m extremely proud to represent my country and if I don’t achieve my goals then I’m hugely disappointed,” he reveals. “It’s only natural for me to spend 4-5 hours a day on the bike or in the gym maintaining muscle mass because there is always an end goal. Mullen will have the opportunity to go one step further when the U23 World Championships take place in Virgina in September but you get the feeling he’s targeting more than just one podium finish this year. Sir Dave Brailsford – the mastermind behind British cycling’s recent successes and Team Sky’s manager – is among the high-profile names eulogising over Mullen and his raw talent. Already an established time trialist and now an integral component of the An Post team, Mullen’s stock continues to soar every time he takes to the saddle but by his own admission, the hard work is only just starting to ensure he fulfils his potential. Email “He's Ireland's brightest young rider but Ryan Mullen is after medals, not praise”. Feedback on “He's Ireland's brightest young rider but Ryan Mullen is after medals, not praise”.